The process of dried mushrooms, as well as the production of other certified food products, requires care and respect of the natural qualities of the product. Max Delizie devotes the same attention and the same respect to the environment. In facts, the staff select the source and collection areas of each ingredient, with the aim to guarantee genuineness and quality in the core product – the dried mushrooms – but also in pasta, dried tomatoes, risotto mixes and all other food specialties. Max Delizie S.a.s. itself is based on an ecological project, with a zero environmental impact. Since 2011, thanks to the installation of a 72,000 kilowatt solar paneling plant that meets all company needs, Max Delizie S.a.s. has been consuming the energy produced by itself during the daytime hours. This modern plant is made of top-rate materials to guarantee durability and long-lasting performance over the time. As far as the extra energy that is required, since 2016, the company prefers the consumption of energy from renewable certified sources. Max Delizie, consuming its own sources of energy and/or guaranteed energy from renewable sources, produces not only certified but also zero environmental impact food products. BeNRG S.r.l. 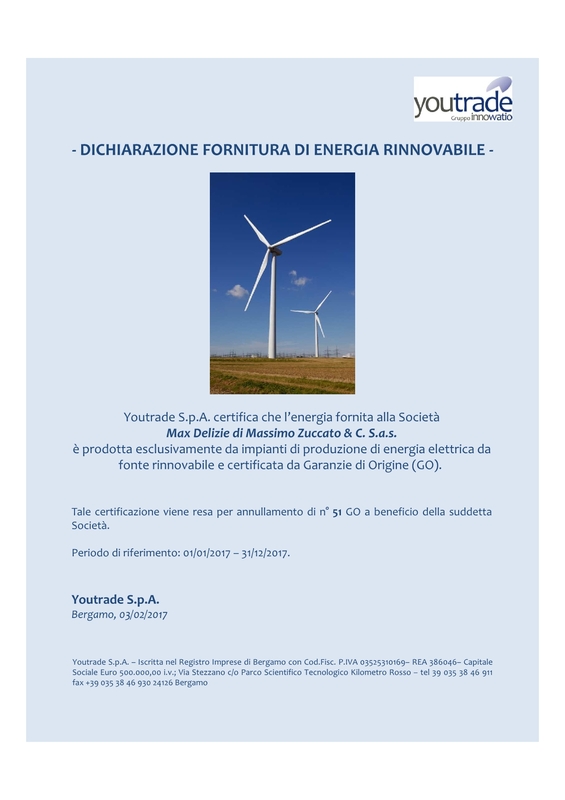 certifies that the supplied energy to Max Delizie S.a.s. of Massimo Zuccato & C. is produced exclusively in production plants of electric energy from renewable and certified sources. Max Delizie was born in 1984 thanks to the love for earth and mushrooms. Indeed, the dried mushrooms are the core business of the company production, together with the Italian dried tomatoes. The wide range of products offers also in oil mushrooms, polenta, mixtures for spaghetti and others specialties. The processing of dried mushrooms and tomatoes meets the IFS standards, thus to offer control and quality: no additives and preservatives, only genuineness directly from the nature.